Aunie Sauce: Hey Aunie, Want To Run a Half Marathon? SURE, WHY NOT! Hey Aunie, Want To Run a Half Marathon? SURE, WHY NOT! I've always been a runner. I won a one-mile fun run when I was about 10-years old, and I haven't stopped since. In high school, I ran track and competed in the 400, 800, 4x400, 4x800 and every other relay that involved either of those distances... heck, I even won my Senior Districts in the 400, and my 4x400 team took home the State gold medal. During my first year in college, I was on the track team at the University of Redlands and my main events were the 400, 800, 4x400 and the 400 hurdles. After transferring back to Boise State and joining their cheerleading program, I began running long distance with my mom (who has run 3 full marathons, including Boston) in our spare time. 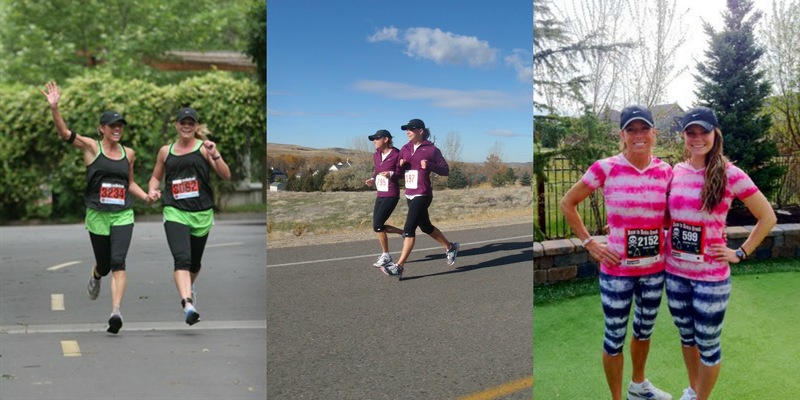 In June of 2009, my mom and I ran our first race together, the See Jane Run "Chocolate and Champagne" Half Marathon (left photo), and finished in 1:48 and first in our age groups. Later in October of 2009, my mom and I again ran another half, the Prison Break Half Marathon. I don't have a photo of us because I had the flu the week of the race and got very sick mid-race, so was in no shape for photos afterward. Two weeks later in November, we ran Zeitgeist (middle photo), a half marathon that travels through the Boise foothills. And then, two years later in April of 2011, we ran Race to Robie Creek (right photo). It's the toughest marathon in the Northwest, and it rocked us (well, me anyway). If you want more juicy race details AND my typical training schedule, read this post! Anyway—long story short—last week, our friends asked us to run the Famous Idaho Potato Half Marathon with them. My mom and I looked at each other, shrugged our shoulders, and said, "Why not?!" Also, it should be noted that I haven't run more than 30-minutes since that last half marathon in 2011... so with absolutely NO training except for two 1-hour (6-mile) runs this week, tomorrow, we are running the Famous Idaho Potato Half Marathon... which is 13.1 miles...so it should be interesting, to say the least! Oh, and yes, we will be wearing matching outfits—our favorite race tradition. Wish us luck... the gun goes off tomorrow at 7:00 am! You and your mom are adorable in your matching outfits! Good luck to the both of you tomorrow! WOW good luck Aunie! :) I hear Robie Creek is a beast. Let us know how it goes! I'm so happy you guys decided to run with us!!! YAY! And bad news my friend... I looked up the race map... It's 13.84 miles not 13.1! What the heck right? How can they just add over a half mile to a half marathon?!?!?! I'm ready to bbq afterwards already. See you bright and early tomorrow!!! I saw that on the map, too. So weird! I wonder if we will be taking a small detour off that official map to make up for the extra bit. Because honestly, that could make a big difference! But either way, I can't wait to run it with you & Seany! Half marathon, Wow!!! Have fun! Thanks Lindsey! We like it, too! It gets us active & gives us time to chit-chat! Thanks Anna! Robie WAS awful. I totally barfed at mile 4. No shame. And I knew people who ran by as I was doing it. Ugh. I'm crossing my fingers that it doesn't happen for this race! Thanks so much, Cynthia!! We will need it for sure! My goal? No walking! Thanks Anna!! It should be 2 hours of sweating, chatting, and some good laughs! Wow, that is so great that you run with your mom! That's a good goal to have ;) You inspire me to keep up with my workouts and hopefully I will be running a half someday! I'm doing the Dirty Girl run tomorrow--only a 5k! haha, I think I'd die running a half marathon. Go you! I'm amazed by runners, can't do it at all! I'm sure you'll be amazing! You'll be great! My dad and brothers started running marathons a couple years ago, and one of my brothers is running a 100 mile ultra marathon this month. Crazy! They have this fantastic homemade pizza that they eat the night before every race that is soooo good! I'd love to be able to run like that, but I am so not there yet. Good luck tomorrow! You'll do great!! ps. I LOVE your tie die outfits! Looking forward to see tomorrow's outfit! Aunie, I hope it went awesome and that you stayed strong. I bet you did amazing! You go girl! LOVE the matching outfits, so cute! I am running a 5k and an 8k this summer and am so scared! I'm not a runner at all. Jealous of people that can run long distances without dying! You can do it! Little by little, just add that mileage and you'll be there in no time! Those kind of runs sound so fun! I hope you had a blast! You had friends running here in Idaho?! Shoot, forget the run... I just want the homemade pizza! I can't even imagine doing an ultra... it sounds honestly dreadful. No thank you... but good for him! You'll do wonderful! Just make sure to train and HAVE FUN! I always feel like wearing fun outfits make the races better... so go snag yourself a fun top or shorts!! Wow! That's awesome - rest up, pretty girl! Friends of mine will be running there tomorrow too! Have Fun and good Luck! What a wonderful thing to share with your mother! Good luck hun! It's a pretty cool way to spend time with your mom. I love your matching outfits btw!